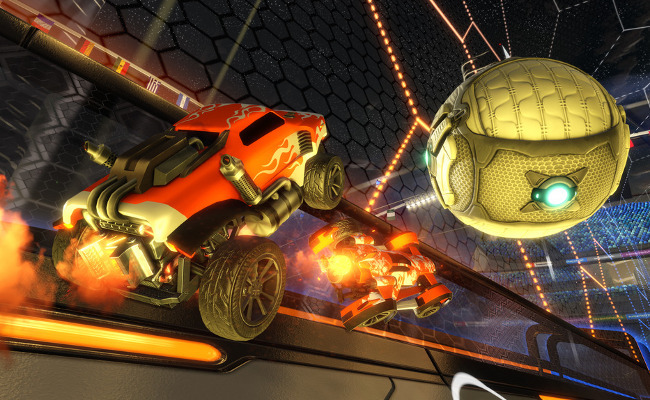 This week on PopMatters, I make up for my paltry Rocket League skills with some pretty words. Before I say anything else: part of my initial attraction to this game was because it was totally unexpected. Every week I feel like something that looks like Rocket League pops up in some Steam promotion and is instantly forgotten by the masses. This time I kept hearing excited murmurs and they grew in number and volume until I had to try it. Rocket League is one of those games that captures why video games are special. It doesn't go for the narrative-driven "would you kindly" gravitas. Instead it tries to model a system that is at once completely ridiculous and completely believable. The make-believe physics of double-jumping rocket cars is tuned to perfection and is rigorous enough that top level players are already making me question meager skills. Rocket League captures the exhilaration and the agony of physical sports without becoming obsessed with the minutia that is bogging down mainstream sports games. It's NBA Jam or NHL 94 but with more sophisticated physics and online play. There's no reason to wait: play it.